SAVE UP TO 99% on Clearance Items! Stretch your budget! Save up to 99% on select products. These items change frequently and quantities are limited, so if you see something you want—act fast! 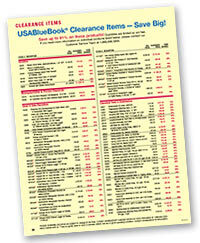 Download a list of our current clearance items here (PDF file). Note: Product availability and prices are subject to change at any time. Items marked with an alpha character at the end of the Stock # (example: 12345A or 12345M) may be gently used or have a cosmetic defect, but are in good operating condition. Customer Service Reps can give more information on any particular item. Customer Service Team at 1-800-548-1234.